This listing is for the cage and stand together as a package deal. The Heritage Cages Kendal or Albany Medium size Bird Cages have a traditional design, and will look attractive in your home, while providing your small birds with a safe living environment. Constructed from powder coated wrought iron, this cage attaches securely to the base by plastic grips. Inside the cage has two perches, 2 feeding bowls, a swing and removable slide try for cleaning. This small domed cage is suitable for multiple types of small birds, including budgies, finches and canaries. The base is manufactured from heavy duty plastic and features a grate and a removable tray to aid with cleaning. Stand Available in White only. 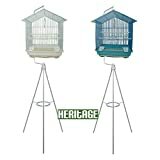 This entry was posted in Birds and tagged Albany, Bird, Budgie, Cage, CAGES, Canary, Great, HERITAGE, Medium, Package, Stand, Tripod, Value by One Boutique. Bookmark the permalink.